Living Life One Day At A Time: my niece is here!!! My sister Missy said she felt crampy and just a little uncomfortable at 6 PM yesterday. I happened to be on the phone with my dad at that time, and Missy was saying good-bye to my BIL as he left for work. My dad and I talked for about 15-20 minutes, and about five minutes after we hung up, my phone rang. I hung up and called my sister and brother to tell them the news and then called my mom's cell phone back. Missy was really yelling now, and my mom was sounding quite frantic as she told me that the contractions were less than a minute apart, and then she hung up on me. I was really starting to worry then because the hospital isn't all that close. So, I waited another few minutes and called back. My mom yelled, "Can't talk now. We talked to her doctor, and we know what we're doing!" Then she hung up on me again. A few frantic minutes later, my dad called to tell me that they made it to the hospital, where someone was waiting at the ER with a wheelchair for Missy. She was taken directly to Labor and Delivery and was found ot be 9 cm. dilated. Just a few minutes later, at 7:44 PM, Abigail Margaret made her entrance into the world. She weighed 6 pounds, 9 ounces and is 20 inches long. Her daddy made it to the hospital 3 minutes before she was born! She's in the NICU though because she is having trouble breathing. The doctors thought she may have punctured a lung during her (super fast) delivery. X-rays showed that she didn't, and now they are thinking she may have pneumonia. She is on oxygen and is getting IV antibiotics. 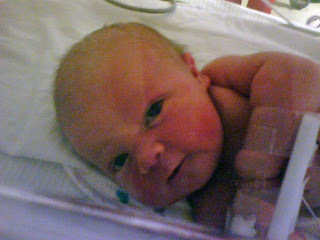 I am hoping she won't be in the NICU very much longer. I haven't seen her yet, and due to colds, basketball practice, band practice, and a doctor appointment, I won't be able to officially meet my new niece until Friday. I am NOT happy about that! I promise to post a pic or two as soon as I take some. In the meantime, I posted the one pic my BIL sent me vial the cellphone. (Gotta love picture phones!) I will update as soon as I have more information about how she's doing. Congrats!!! I hope Abigail gets better soon!!! What a cutie. Glad they made it to the hospital too, that was a close call! Has anyone ever told you that your boys have great hair??? what a story...so happy for her and the family. Praying Abigail gets all better really soon.